Taco Bell's new waffle taco. Remember when McDonald's decided to make the bread encasing a McMuffin taste like maple, and called it a McGriddles sandwich? Seems so quaint now. 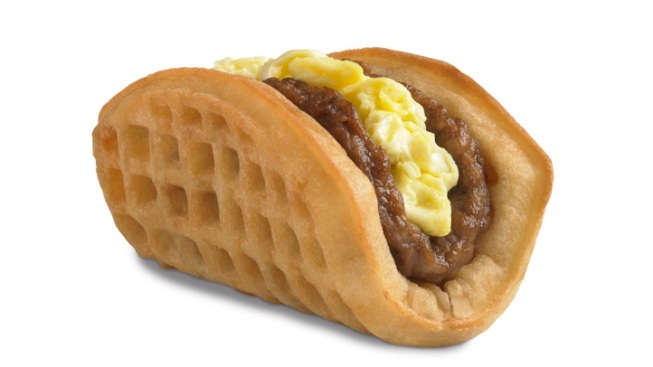 And now, because a breakfast burrito doesn't make enough sense on its own, Taco Bell is adding the waffle taco to the rapidly expanding list of options available to those who just can't decide between savory and sweet in the morning. Just as its name suggests, the newest addition to the Taco Bell menu consists of a sausage patty and scrambled eggs tucked into a waffle that's been manipulated into the shape of a shell. (True story: Frying technique and temperature had to be adjusted multiple times to get that effortless fold-over look!) Syrup to drench, er, drizzle over the top comes on the side. But the waffle taco, which boasts 460 calories and 30 grams of fat, isn't everybody's for the feasting just yet. Visitors to five locations in Southern California got to sample the goods earlier this year, but it is currently just one item on a full breakfast menu that will be rolled out Thursday to 100 restaurants in Fresno, Calif., Chatanooga, Tenn., and Omaha, Neb., to see how the new selections go over before people can make a run for breakfast at all 6,000 Taco Bell locations in the U.S.
Do people come to the home of the Volcano Menu and the Nacho Cheese Doritos Locos Taco Supreme to make "sensible" dining choices? So, how does a waffle taco sound to you?! PHOTOS: Get in the mood: Classic morning food to enjoy at night!